We’re always on the lookout for fun Christmas crafts that the whole family can do together, and this one definitely fits the bill! These are fairly large, so they wouldn’t necessarily make great ornaments (although you could use little popsicle sticks instead of the big ones to make miniature versions! 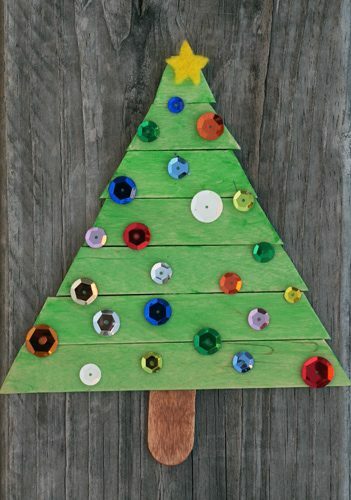 ), but you could add a magnet to the back to make a cute refrigerator magnet or create a flat base out of clay to make a row of standing trees. 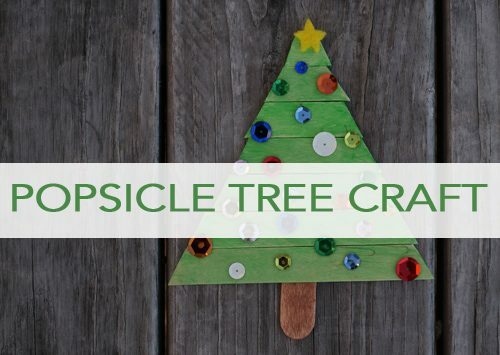 Line up seven popsicle sticks and use another popsicle stick to carefully draw two diagonal cut lines on the sticks in the shape of a Christmas tree. Cut the popsicle sticks on the inside of the lines (so they don’t show), but don’t worry about cutting them exactly; the trees look better when they’re not perfectly perfect! Have your kids use their finger or a paint brush to paint the seven cut popsicle sticks green and an eighth one brown. I think it looks better when you paint both sides, but you could get away with just painting the front. Add glue to the right side of the brown popsicle stick and begin gluing the green sticks in place, starting at the top and working your way down. Set aside to dry. Once the tree is finished drying, it’s ready to decorate! Older kids can add their own glue and sequins without much direction. For preschoolers, I recommend adding a few glue dots at a time and letting them practice their fine motor skills as they add the sequins to each of their dots. Don’t forget to cut out a star from the yellow felt and glue that on top. Once the sequins are glued in place, add a magnet or ribbon to the back for hanging.